Hello dolls!! Hope you're all happy and healthy on this lovely Tuesday. It's busier than ever on my end, so to keep things flowing smoothly, I'm going to implement a new blogging schedule for this second quarter of the year. My goal is to produce two blog posts a week, one focusing on makeup looks / tutorials and the other focusing on nails and/or fashion. This new set-up should organize my content and help you keep up and tune in on a more regulated basis. Make sure to follow me on Instagram & FB for sneak peeks, teasers and other content that doesn't make it on the blog. 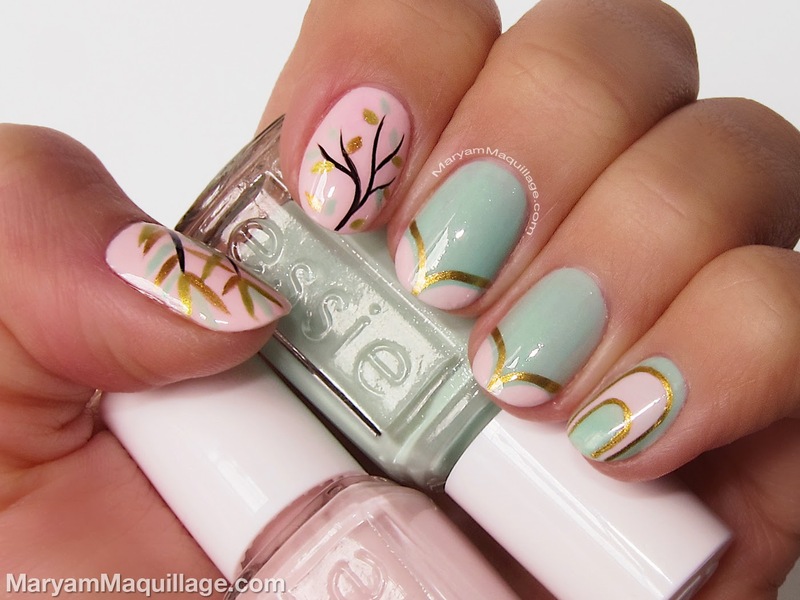 Today's Tuesday Trend is all about Spring Nails and how to incorporate Pastels into your nail art. Shall we get started? Let's go! Read more for tips, products & how-to's! Pastel Nail Art #1: "Sprouting Mint"
This fresh pink and mint combo is one of my favorites for Spring. For the base colors, I used two polishes from Essie Spring / Printemps 2014 Collection "Fashion Playground" (mint) and "Romper Room" (pink) and hand-painted either botanical or mod geometric designs on each nail. I kept the nail shape squoval (between square & oval) to emphasize the flowing lines of the nail art. Pastel Nail Art #2: "Pink-n-Gilded"
This delicate design for oval nails is super chic and feminine. 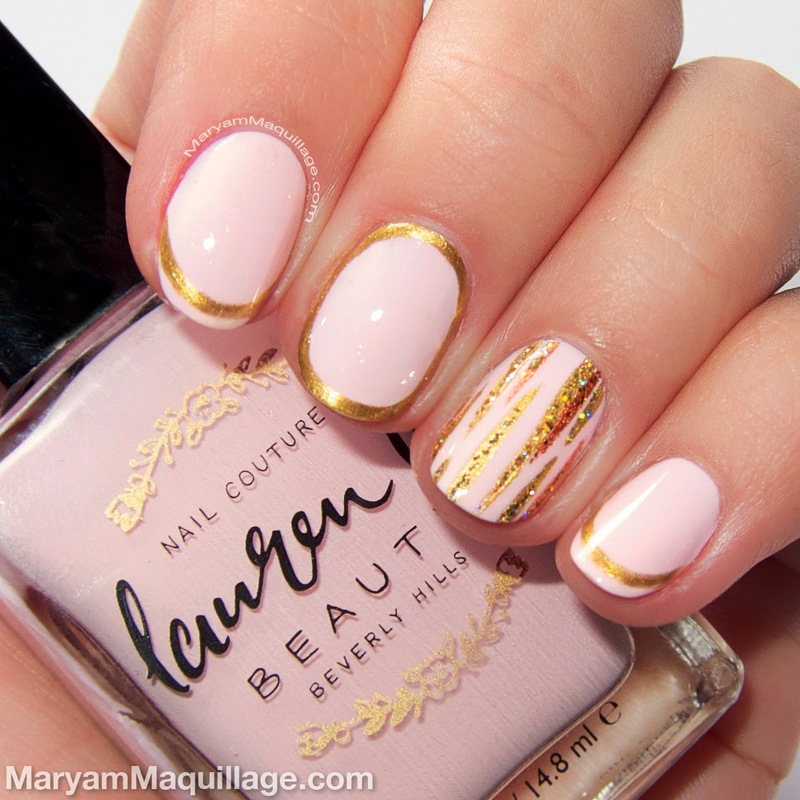 I used Lauren B Beauty 5-free nail polish in "City of Angels" (a gorgeous opaque pale pink) for the base color and topped the polish with simple free-hand gold strokes on the accent nail and border-liner / French tip on the rest of the nails. 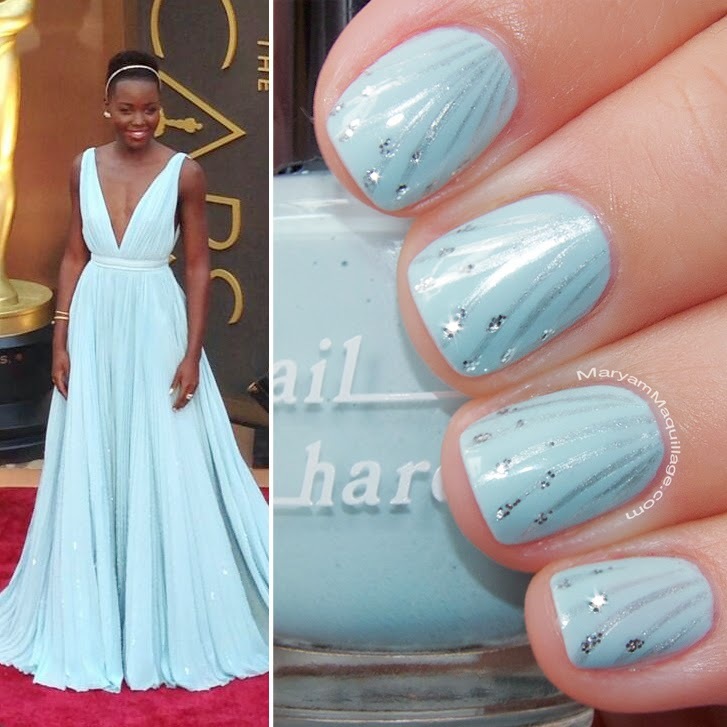 Pastel Nail Art #3: "Nairobi Blue"
If you watched the Oscars red carpet shows this season, then you already know the inspiration behind this soft, glamorous nail design: Lupita Nyong'o and her glorious Prada gown, which she proclaimed as "Nairobi Blue". For this design, I found an old polish in my stash that came closest to the color of Lupita's dress. To replicate the flowing pleats, I painted airy, silver strokes and added accents of silver glitter to match the accents on the gown. Pastel Nail Art #4: "Lilac Love"
You've probably already seen this design in my older blog post, but I had to include it again, since it's so quintessentially pastel and spring-appropriate. 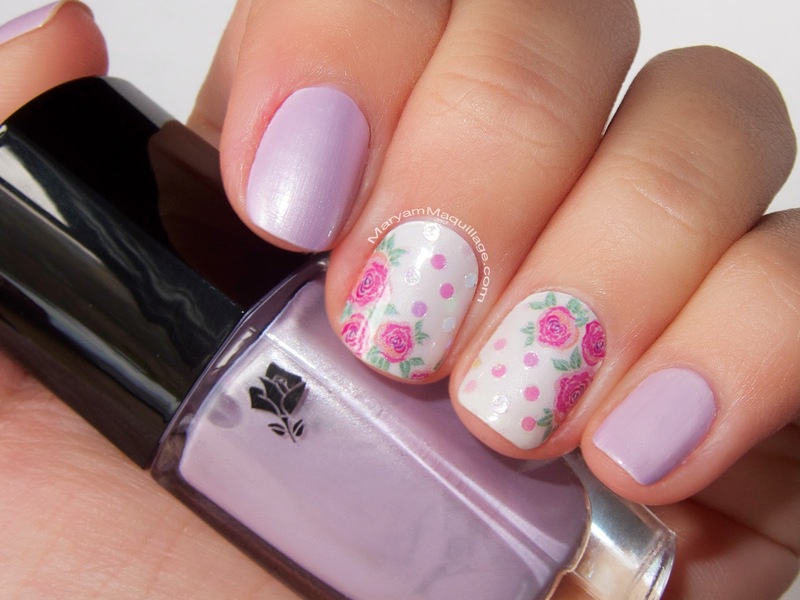 The inspiration for this nail art came from Lancome's latest Spring polish collection and the star shade, Lilac Love. I used nail polish appliqués for two accent nails and decorated them with large iridescent round glitters. Lancome Vernis In Love "Lilac Love"
Incoco Garden Daydreams Collection Nail Polish Appliqués in "Tea Party"
I love the design that you've done on the first picture, and the lancome roses design is lovely too. oh wonderful nails! i love pastel nails!! and this is such a great inspiration! in the second picture i love the rosecoloured nails with gold so much! Simply stunning! I wish I was half as precise and creative as you are with your nails! Wow! I don't know how you come up with so many different ideas for nail art! 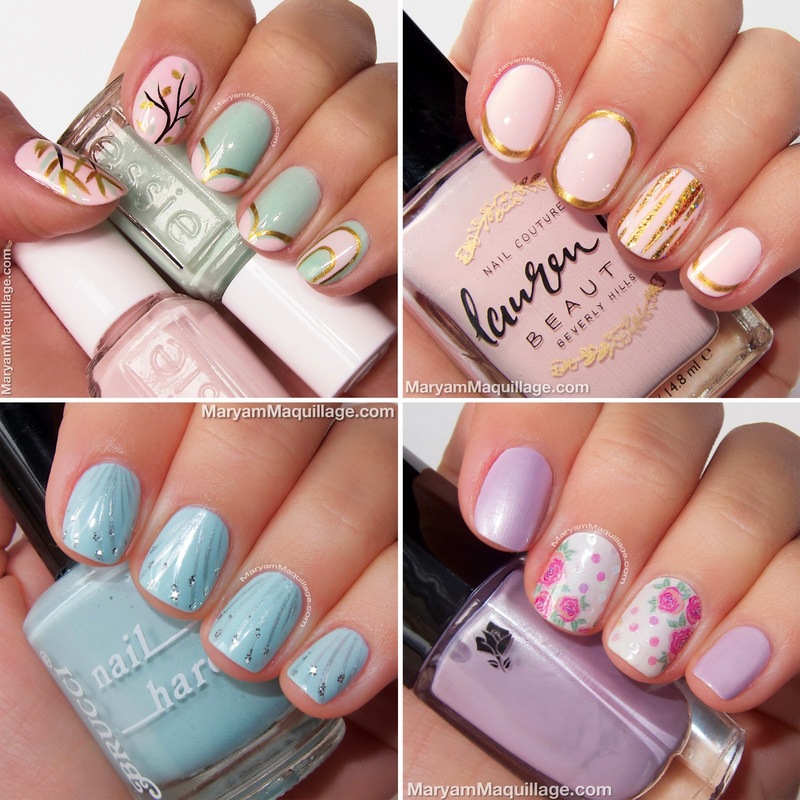 Maryam, I love the pastel nail art that you have showcased here. I am always an ardent follower of this blog and I mostly like the posts on acrylic nail designsThe pastel nail Art #4: "Lilac Love" looks great.